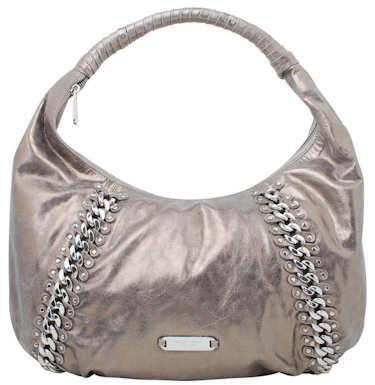 The Michael by Michael Kors Silver Hobo Bag is a metallic leather bag with a top zip fastening and a single carry handle. It features luxurious chunky chain adornment to the front and is embellished with a Michael Kors silver tone plaque at the lower front centre. Inside, the bag is lined in signature fabric and there are multiple interior pockets.